After successfully agitating for the vote for women from the 1890s, Protestant women's organisations in Australia began to educate women at a grassroots level on effective ways of applying political pressure on a wide range of topics and social concerns. Positioning their organisations as non-party-political and separate from more overtly feminist groups, the Woman's Christian Temperance Union (WCTU); the Young Women's Christian Association (YWCA) and the Mothers' Union attracted women who were keen to work for change, and who were seeking to 'save' the individual as well as the greater society. These three organisations sought to agitate on a wide range of issues related to girls and women, connecting with public anxieties and highlighting particular vulnerabilities of girls and young women who lived alone in the city and had the potential to be exploited in the workforce. By the 1920s and 1930s these women's groups noted with concern the easier access to divorce and birth control in the Soviet Union and the growing influence of both Communism and 'Hitlerism' in galvanising young people. 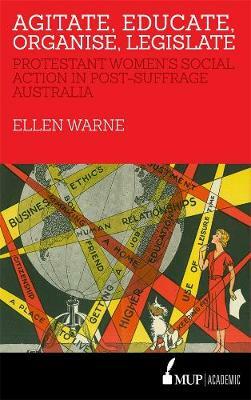 Agitate, Educate, Organise, Legislate explores the colourful debates and anxieties that were prevalent from the 1890s to the 1930s and the responses of the key women's organisations whose leadership and campaigns acknowledged that;outside of parliament and party politicsa "women's connection to political matters could be both innovative and socially influential.